A wonderfully light room with an evocative view of the Georgian roof tops and the grand Anglican Cathedral which adds to its splendour by glowing romantically at night. This large suite feels like a sequestered self-contained apartment. An outer door from the main staircase starts your journey along an up lit corridor. Then the double-height space with illuminating sky light draws you in. You are welcomed by a beautiful late Georgian/early Victorian sofa and unique velvet upholstered ottoman at the foot of your King-size bed, complete with its large headboard mirroring the shape of the sofa. Two elegant oversized lamps adorn the bedside tables and two original art works adorn the walls, both by Turkish artist Ayse Kucuk. The bed is dressed with sumptuous 500 thread count Egyptian cotton linen. 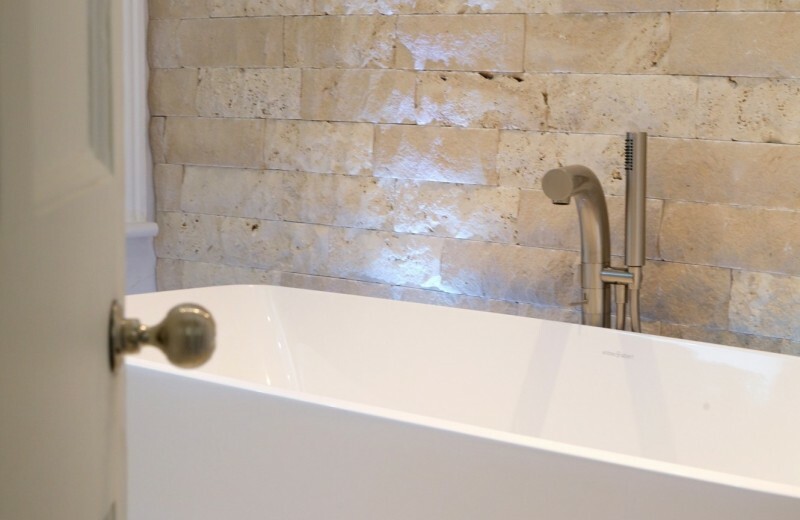 The large en suite has an elegant freestanding Victoria and Albert bath that stands in front of the raw, split face stone wall and gains yet further character by night as the up-lights in the floor subtly accentuates its’ three-dimensionality. The room includes Wi-Fi and wired connections, a 40” Smart Television discreetly positioned in the compactum wardrobe and a marvellous Sonos music system that will play your personal music from your phone or you can listen to any artist or genre of music you choose, even international radio stations.